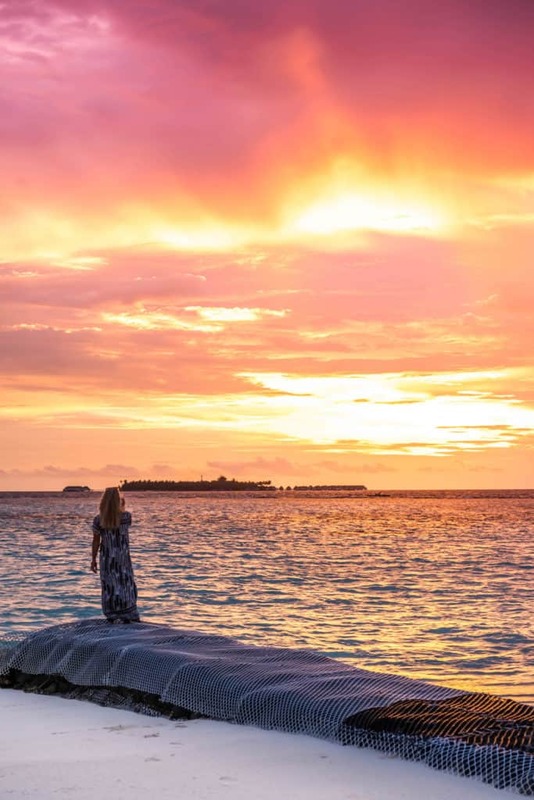 Looking for a peaceful Maldives vacation far away from civilization? A place where nobody knows your name and you can swim in bliss with the manta rays, whale sharks, and sea turtles? We arrived ready to relax on an intimate island in the Indian Ocean where there is no need for shoes. 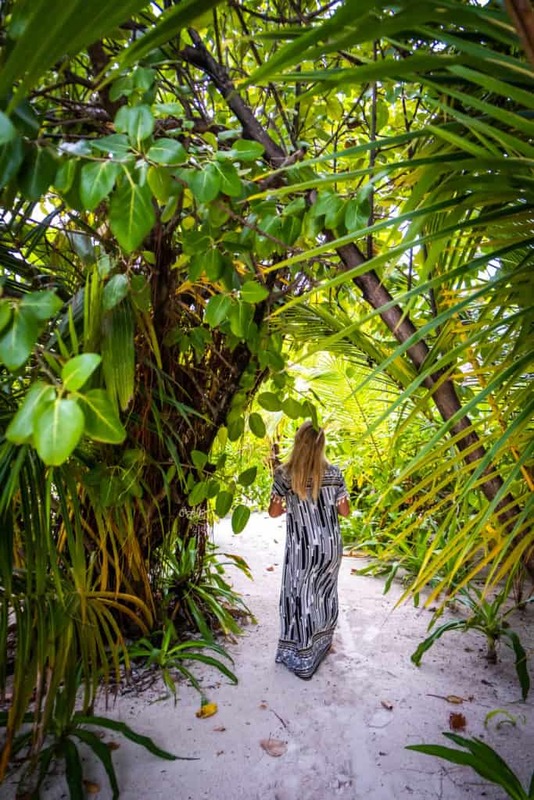 Here’s what you can expect checking into Maafushivaru Maldives on the Ari Atoll. 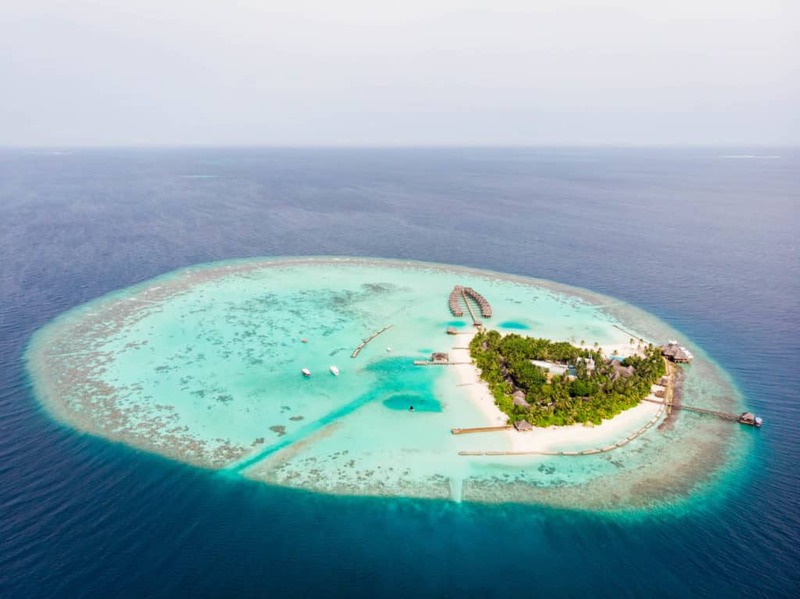 Maafushivaru Maldives is located at the Southern tip of the Ari Atoll. While technically you could take a boat transfer to the resort from Male, it would take several hours in potentially rough seas. So, most visitors will get to Maafushivaru via seaplane operated by Trans Maldivian Airlines. You cannot book seaplane flights directly and they must be coordinated through your resort. 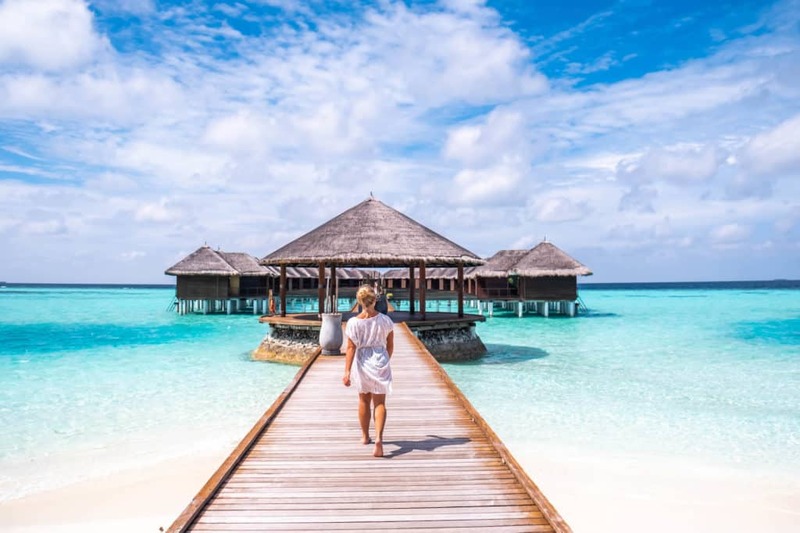 Seaplanes are $500 round trip to most resorts in the Maldives, so it’s important to factor that price into your overall budget when planning out what Maldivian resort you want to stay in. 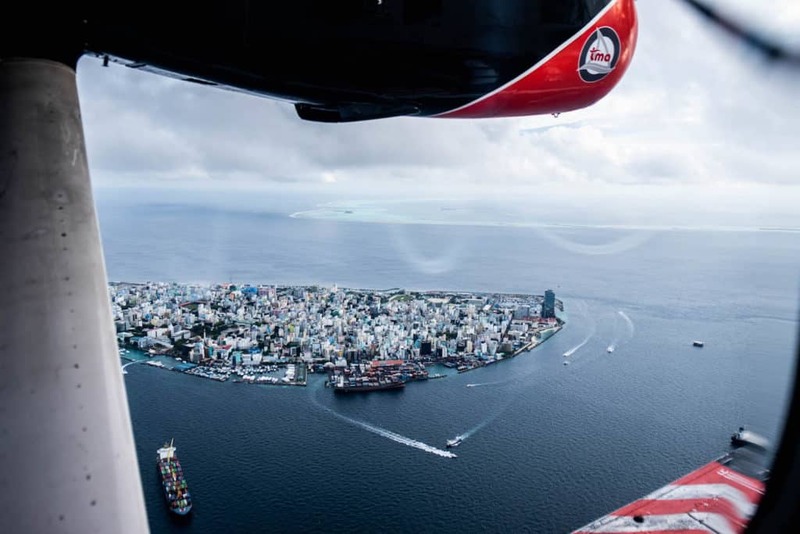 Please keep in mind this is common for just about every resort in the Maldives that requires a seaplane flight. Maafushivaru has less than 50 rooms making it one of the smaller resorts in the Maldives. You can walk the entire island in just a few minutes. 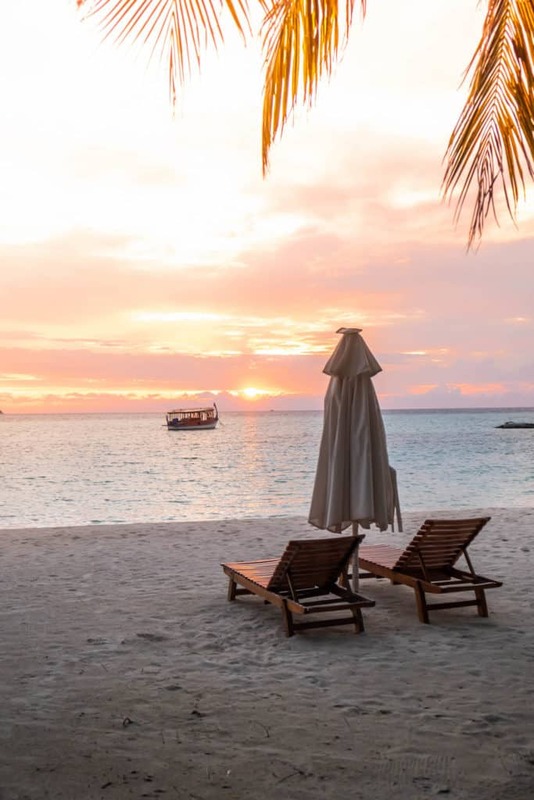 If you are looking for a quiet holiday in the Maldives away from the loud music and mass crowds you will absolutely love the vibe at Maafushivaru. 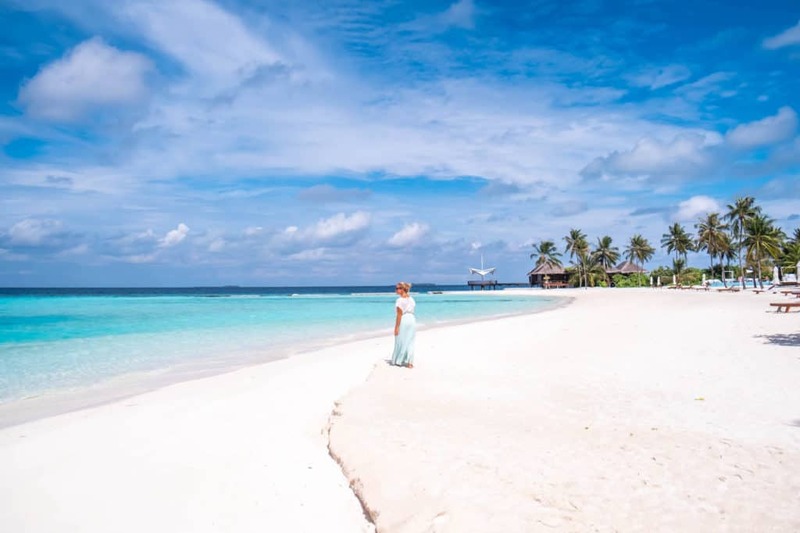 It also has the ability to break away from that resort vibe that you’ll find at some of the larger resorts like Kuramathi. The resort features an activity center, dive center, three restaurants, two bars, a spa, gym, and a pool. It’s all pretty impressive amenities to have for such a small resort. It leads to an intimate setting where it’s easy to find your own private spot. There are three room types at Maafushivaru – Beach Villas, Pool Villas, and Water Villas. The most common room type is the beach villa which is where we called home. Rooms are complete with an outdoor bathroom, sun chairs, sun bed, king-sized bed, DVD player, wifi, coffee machine, and we even had a bottle bubbly waiting for us. Honestly, we didn’t spend much time in the room as there was so much to do around us! However, what we loved the most about it was the direct beach access with two comfortable loungers waiting for us to enjoy. Morning time was relaxing as you could wake up and listen to the ocean with an espresso in hand. At some resorts when you are on the beach services more guests and it can be hard to get privacy. Due to Maafushivaru being so small you could get an entire morning or afternoon without ever seeing another guest! Breakfast, lunch, and dinner are all served buffet style at Maafushivaru. Honestly, we didn’t love the buffet food and it was one of the main flaws about the resort. With over 300,000 Chinese visitors a year to the Maldives, the resorts definitely have an influx of Chinese guests and we found that most of the buffet food was Asian inspired. Great for them – but bad for those with an international or vegetarian palate. That being said they do have one a la carte restaurant on site. 135 degrees east, is a Teppanyaki restaurant that sits on stilts along the calm Indian ocean. Teppanyaki, similar to a Hibachi style restaurant where chefs cook in front of you in the US is becoming popular in the Maldives. Maafushivaru was one of the first resorts in the Maldives to dish up this style of food and it is absolutely delicious. They also whip up fresh sushi! We found the service staff incredibly friendly at Maafushivaru. Every encounter we had with them was met with a warm hospitable smile which can make or break the vibe in a Maldives resort. The journey out to Maafushivaru may be far for most, but there is are good reasons to venture out to the resort. The answer lies in the excursions and location. For starters, Maafushivaru has a nice house reef! We snorkeled around the entire island and within the first twenty minutes we found an abundance of beautiful parrotfish, turtles, black-tipped reef sharks, and even an octopus. 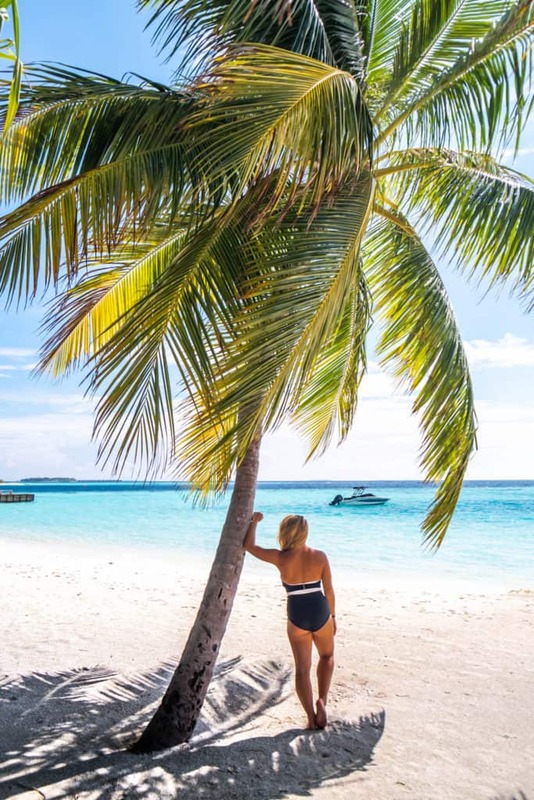 For snorkelers, it’s a great place to come and really see vibrant marine life unlike other spots in the Maldives where the resort has destroyed much of the reef. Maafushivaru’s location on the South Ari Atoll also means that you are close to whale sharks, manta rays, and giant sea turtles. Maafushivaru runs excursions every morning that takes guests out to go snorkeling with the marine life. We joined them for a morning of swimming with Manta Rays and saw at least 10! We almost hopped on the whale shark excursions too but opted out because our time doing it in Mozambique could not be topped. Plus we had gotten word that there are often 100+ people in the water for one or two whale sharks. Maafushivaru also has their own dive school for those that are certified or interested in learning. They operate scuba trips three times a day to many different locations. Tell your dive master your interest so they can take you to an epic spot! 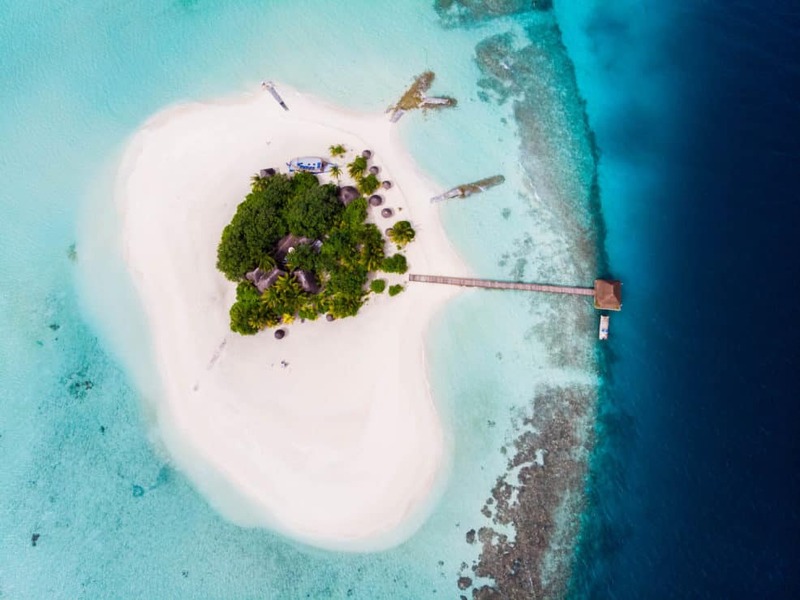 For a truly unique experience in the Maldives, guests can book a night on the private Lonubo Island. Lonubo is a stunning empty island just a boat ride away from Maafushivaru and can only be accessed by Maafushivaru guests. 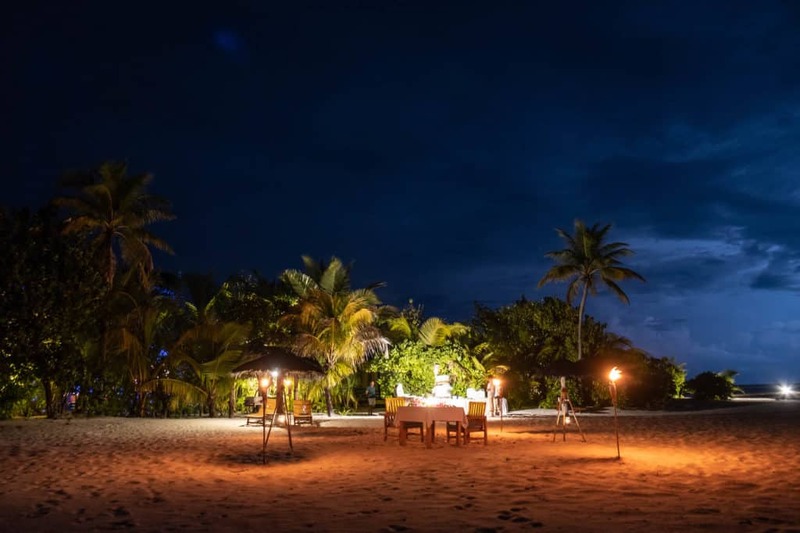 Every few days the staff take people over to enjoy the island for a few hours, but if you want seclusion you can book a night of romance all to yourself. Starting just before sunset the staff will take you over to watch the sun go down. Once evening hits a private three-course dinner on the beach with champagne awaits. 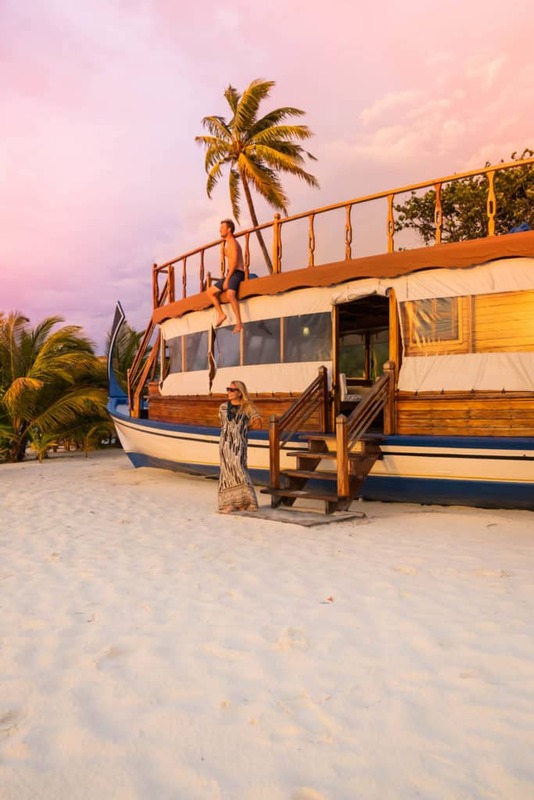 If you are looking for a romantic option while at Maafushivaru Lonubo island is a great add-on to your Maldives vacation. We were looking for a quiet Maldivan getaway away from Male and mass tourism and we found it at Maafushivaru. 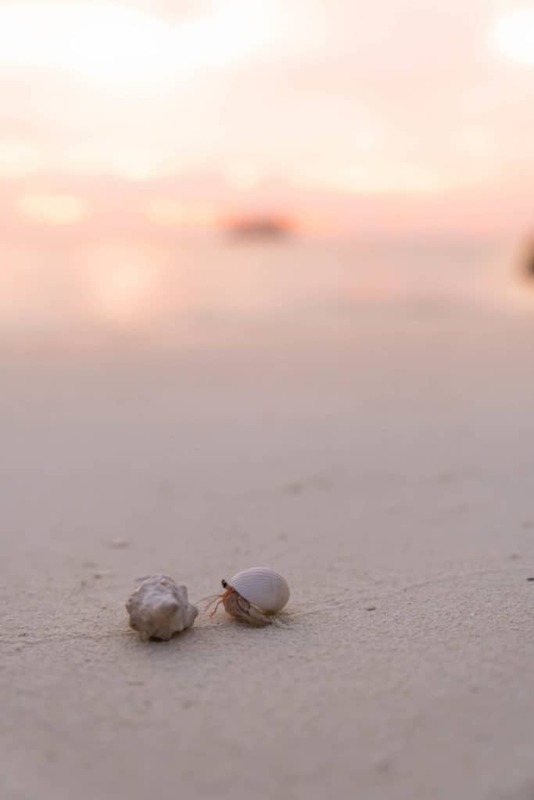 It’s great for all types of travelers to enjoy – but in particular, if you really care about the marine life in the Maldives. The house reef, snorkeling excursions, and diving was top notch in this area of the Maldives. All that are passionate about being underwater will certainly love their time here. There’s no loud music and no flocks of tourists with hundreds of villas and bungalows. Perhaps this is what the Maldives used to be before Instagram and the overwater bungalow craze hit. Relaxing, quiet, and the best place to find your zen. You’re sitting in the middle of the ocean so it’s best not to contribute to the problem buying plastic water bottles everywhere. We’ve shifted to using an insulated aluminum water bottle as it handles the hot sun well. However, we also love filtered water bottles in areas we’re uncertain of the water supply. Read more about favorite water bottle for travel in our post. Most hotels in the Maldives won’t provide this and will charge a premium to purchase so make sure to come from home. We suggest you wear eco-friendly sunscreen when going entering the ocean in order to protect marine life. With all of that sun, white sand, and reflection you need to protect your eyes in the Maldives. The Chromapop lens technology is like seeing the world with a fresh set of our eyes. They enhance contrast, reduce glare, and reflection for superb vision while driving, walking around town, or out on the water. We also love the style of the glasses for anyone who likes to live an active lifestyle. The highlight of any trip to the Maldives is not the beaches, it’s the abundant marine life. If you make it all the way out to these coral atolls in the Indian Ocean it would almost be a crime not to seek out some of the marine life. We like to travel with our own gear as it saves us rental fees, but most importantly it’s new, fits our face, and no one has slobbered on the snorkel piece before. If possible head to a local dive shop to try fins on yourself as making it fits right to your foot is important. That’s why we only recommend picking up a mask and snorkel, worst case scenario you can rent a pair of fins from the resort. Dry bags are great if you’re going to spend time at the beach or find yourself out on a boat. They will protect your phone and any other electronics from the ocean, or more importantly if it starts to rain. We found them really important when we went out on our diving trips. See our favorites here. We never travel without travel insurance with World Nomads. Natasha is a bit of a worry wart and would rather stay safe than sorry. World Nomads is ideal for flexible and great plans!